When my much-loved grandmother died in 1986, there was only really three mementos that people in the family wanted. Two of these are still in the family, but the third was never found. Nan's whisky glass. It was nothing special as such. Indeed, I guess it was a seaside souvenir. But it was Nan's whisky glass. As far as I remember, it was slightly smoked glass, with a gold rim and three gold lines, one for one measure, one for two measures and one for three measures. The one-measure line had one little pig on it, the two-measure line had two little pigs on it and the three-measure line had three little pigs on it. Of an evening, my Grandfather would say, "do you want a whisky, Gin?". (Her name was Agnes, but she was universally known as Ginny or Gin.) When she said yes (and, to be fair, she rarely didn't, Vic would ask "One piggy or three?". Yes, I know, it is all too cutesy, but that was my grandparents. Ginny's whisky glass was lost forever, but I have always felt that if I ever saw one, I would snap it up. But try as I might, I have trawled the web to no avail. 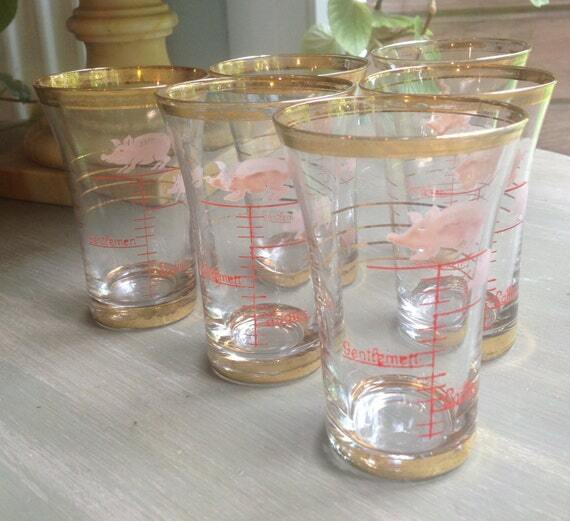 Your mission: Find me a piggy glass! That should keep you out of mischief over Christmas! I post this in "Addicts' Corner" with no explanation as to what it is I may be addicted to: nostalgia or whisky. I had a similar years-long search for old fashioned pilsner glasses like the ones we had when I was a child. None of us drank beer, but mom put tapioca pudding in them. The glasses had etched dots. I finally found a set last year - and you can bet I bought them! I'll keep my eyes peeled for the piggy glass. I understand the memories. 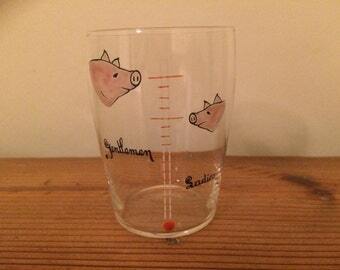 Phil: this one is described by the vendor as "Gentlemen/Ladies Pig Shot Glass 1950s". 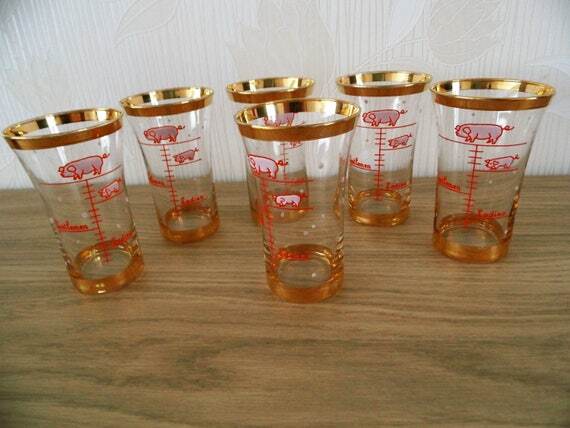 And: "Six liquor glasses with dosage for gentlemen and ladies, gold lines, pig figure". "Set of 6 humorous glasses". I've PM'ed you the respective URLs of the vendors' pages. Why "pigs" though? I wonder if it has something to do with piggies and digits..."this little piggy went to market..." A three finger whisky for Ginny. You go girl! My memory is clearly not what it used to be ... well ... I think I remember that it used to be better. I am pretty certain that the ones in the second picture are identical. It seems that a dealer in Cornwall currently has a set on Ebay! A big piggy seems to be an awful lot of whisky, even by my standards! Yay! Happy you found them so quickly.